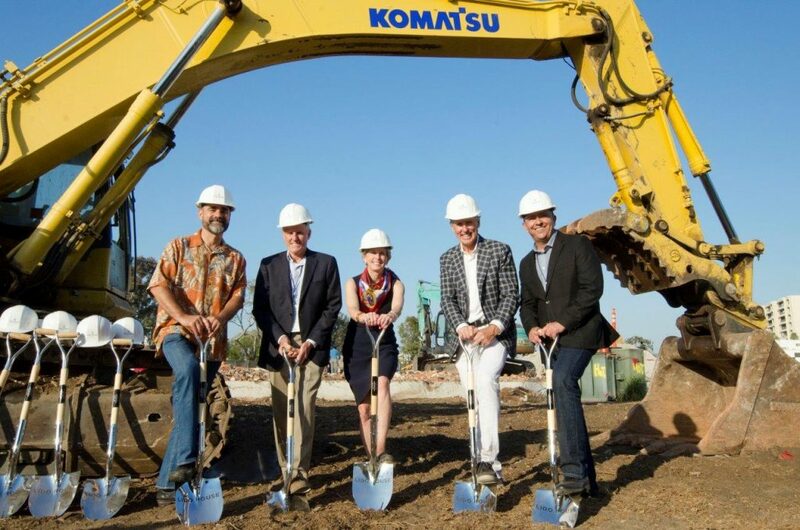 Officials break ground on Lido House Hotel on the Balboa Peninsula last week, (left to right) Martin Deidrich, Founder of Kean Coffee; Ian Gardiner, Executive Vice President of R.D. Olson Construction; Diane Dixon, Mayor of Newport Beach; Bob Olson, President & CEO of R.D. Olson Development; and Greg Villegas, Associate Vice President of WATG. Officials broke ground on the Lido House Hotel last week, marking the first physical step toward making the 130-room boutique hotel planned for the old city hall site at 3300 Newport Boulevard a reality. Several people dug shovels into the dirt on June 30 during a groundbreaking ceremony, including: President & CEO of R.D. Olson Development, Bob Olson; Executive Vice President of R.D. Olson Construction, Ian Gardiner; Associate Vice President of WATG Greg Villegas; Newport Beach Mayor Diane Dixon; and several other city council members, project officials and community leaders. City officials and community members have emphasized the hotel as part of the revitalization of the Balboa Peninsula. The City Council approved the hotel in 2014 and the California Coastal Commission gave the project the green light last year. Newport Beach Planning Commission also recently unanimously approved a 4,745 square-foot expansion for the hotel. It is a 4.8 percent increase to the maximum floor area. The hotel is scheduled to be complete next summer. Lido House was designed by WATG. The general contractor is R.D. Olson Construction, directed by President Bill Wilhelm. Novato-based EDG will provide interior design services, and Autograph Collection Hotels, a division of Marriott, will be the operator.